What Have We Learned after Preds Strong Start? In front of a sell-out crowd of 17,113; the Predators sealed their second win of the season on the heels of a three-goal third period. Nashville broke out of a 1-1 tie when Paul Gaustad and Eric Nystrom scored 1:21 apart, and Roman Josi potted an empty-netter from their own blue-line to take the game by a final of 4-1. We’ve certainly learned a lot over the past two opening games, so let’s dive right into it. The first two games have revealed quite a bit of what to expect over the course of the next six months of the season. Head coach Peter Laviolette’s high paced, skill oriented system looks like it was in full effect throughout the two games as for long stretches of time. His team looked dominant and could score at the tip of a hat. For some reason though, Nashville has scored all but one of their goals in the third period which might as well have been in the third as it was scored with 41 seconds left in the second period by a wrist shot from Shea Weber. “I think it’s confidence. You become a good third period team by doing what we have, coming from behind. We won a game in the third tonight. You get confidence in yourself knowing that you can do it. That’s one thing, but consistently the past couple of games we have just been doing the same things over and over and have had waves of attack and putting pucks in the net. It might not happen in the first period, but you stick to it in the third. Maybe in the next game it’ll happen in the first, we’ll score a few. 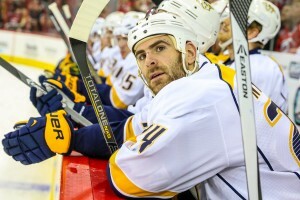 You just got to stick to the game plan,” said Eric Nystrom on being a third period team. The “waves of attack” Nystrom spoke of is extremely relevant, as a key stat is Nashville has outshot their opponent in every period of the season with combine shots equaling 70-38 in favor of the Preds. Granted it’s still early to see if the players can sustain the style of play however this is a great execution of the system. Side Note: Tonight’s victory was number 391st for Peter Laviolette, allowing him to pass Hall of Famer Fred Shero for 31st on the all-time NHL wins list. If you told me that Paul Gaustad and Eric Nystrom would be the team leaders in almost every statistic after the first two games then I would have thought you were crazy. However the stats don’t lie; they are both tied with four points, a +5 plus-minus, Gaustad has five penalty minutes, and they both scored a Game-Winning-Goal. Now granted its only two games in, and to be fair, Nystrom has a shooting percentage of 100%, while Gaustad is 33%. Only Roman Josi has higher at 50% and his goal was into an empty-net. Laviolette said, “I think everyone played a really hard game tonight. Those guys are working, and they’re putting pucks at the net and doing a good job defensively as well. It’s nice to be able to see those contribute like that,” when asked about the play of Nystrom and Gaustad. It’s a long season, and if these players can provide this kind of consistent play, it’s going to make things easier for the Preds. I wrote recently about Forsberg’s ability to win the Calder Trophy this season, and the 20-year-old certainly hasn’t disappointed through the first two games. Forsberg is currently playing on a line with Derek Roy, and Craig Smith which has looked dynamite so far. The chemistry between Forsberg and Smith especially looks clear as they teamed-up on a bunch of great chances throughout the games. Even though he recorded three assists in the first two games, Forsberg’s best play came when he made a fantastic between-the-legs move around now Ottawa Captain, and fellow countrymen, Erik Karlsson. Coincidentally, a couple of seconds after the failed backhand shot from the move, Shea Weber came down from the point and potted a quick wrap-around goal past goaltender Craig Anderson.